Enterprise resource planning (ERP) systems emerged in the 1990s. Even though they don’t do much in the way of planning, the systems provide companies a means of centralizing and consolidating transaction data collection (such as purchase orders, inventory movements and depreciation), automating the management of processes, and handling the bookkeeping and financial record keeping for these transactions and related processes. ERP systems are an indispensable piece of IT infrastructure in today’s enterprises. Alas, they also are inherently flawed. But perhaps not for much longer. ERP systems are about to undergo a considerable transformation, driven by the growing availability of technologies that can address the shortcomings of today’s systems. As I noted in my research agenda on the Office of Finance, the demographic shift taking place in the ranks of senior executives and managers – from the baby-boom generation to those who grew up with computer technology – will drive demand for a new generation of software. Soon, to be competitive, ERP systems will have to deliver a better user experience, greater flexibility and agility, as I have said, as well as mobility and lower cost of ownership. In many respects, today’s ERP systems are exactly what people don’t want anymore. They are notoriously time-consuming and expensive to set up, maintain and modify. 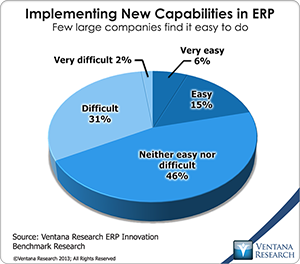 In our ERP research only 21 percent of larger companies said implementing new capabilities in ERP systems is easy or very easy while one-third characterized it as difficult. Because of this, the current generation of ERP software acts a barrier to innovation and improvement. To be sure, more than any other piece of enterprise software, ERP systems are a challenge because of the complexities of business organizations. This isn’t going to change. 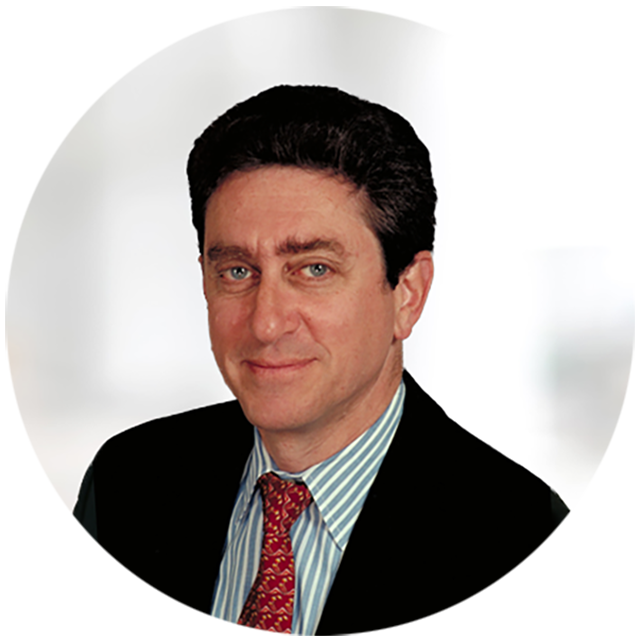 I’ve spent decades examining all sorts of businesses from multiple perspectives – from strategic, high-level business models to footnotes in financial statements and the execution of specific manufacturing and financial processes. To the uninitiated, everything about business appears simple until they get into the details. Then, even when you strip out inessential elements, it’s still complicated. As well, in any organization, there are competing requirements and priorities at work when an ERP system is set up. Thus, when a global airline changed its inventory management system, consultants – with the accountants and auditors in mind – designed it to minimize the possibility of shrinkage. The old system allowed pilots to radio ahead to have needed spares on the ramp when they landed. The new system, however, required the defective part (say, a radio or a switch) to be returned before a new one was issued. Consequently, the airline soon found its $150 million aircraft with hundreds of passengers aboard delayed at the gate for an hour or more as $15 replacement parts were laboriously checked in and checked out. Although some aspects of ERP will always be complex and require experienced assistance to design and maintain, techniques for mass customization can make it easier to implement, maintain and change, thereby eliminating a significant portion of the cost of ownership. To be sure, software companies have tried to minimize deployment costs. For a couple of decades, ERP vendors have offered packages aimed at specific industries such as aerospace and pharmaceuticals. Those addressing midsize companies, which have tighter budgets than large ones, offer out-of-the-box configurations aimed at even more specific types of business, such as steel service centers, manufacturing job shops or brewers. For more generic businesses, today’s cloud-based ERP systems are one solution to the problem of costly updates and reconfiguration. However, this option still may not be attractive if an organization is in a business that has very specific customization requirements that a more generic ERP systems cannot support well (for instance, process-manufacturing industries such as specialty chemicals manufacturing). Another issue that vendors such as Infor and Oracle are addressing is the challenge of updating on-premises systems. Their motivation in making updating as easy and inexpensive as possible is to keep existing customers on maintenance and not lose their annuity revenue stream. In the North American market (and to a lesser degree elsewhere), major upgrade cycles provoke companies to reconsider whether a new system from another vendor would be preferable. Some progress has been made over the years to minimize the difficulty and cost of configuring and updating ERP software, but much more is needed. A second area of ERP systems that needs attention is the user experience, which is an increasingly important aspect of all business applications. The dull, cluttered and difficult-to-navigate interfaces that have been the norm are the result of inexperience in design and constrained computing resources. The next generation of ERP systems will be designed with decades of experience and far more powerful computing platforms and tools than the current one. In the 1930s, Raymond Loewy and others revolutionized the design of everyday objects, from soda fountains to locomotives and automobiles so that form and function combined to produce a better product. Apple’s success has much to do with brilliant integrations of design and technology. Today, it’s even more important to apply basic concepts of industrial design and ergonomics to creating user interfaces. This goes beyond making old code bases pretty. Largely because of tablets and mobile computing platforms, people now work with multiple types of interfaces and use a wider range of methods and gestures to interact with their devices. Next-generation ERP software must reflect these changes. It’s also clear that ERP systems will be faster in the future, as technology such as in-memory processing will eliminate nearly all batch routines. Faster and more cycle times promote corporate agility because more frequent cycles become feasible and necessary information is available sooner. As well, another important change that is already under way is the ability to do real-time or near-real-time analytics on data held in an ERP system. This was to some extent feasible nearly 20 years ago with Coda (because it was built on a multidimensional database) and is part of Infor’s and Oracle’s longer-term architectural strategies. Moreover, business and social collaboration is an important set of capabilities that has been taking hold in business, as our research found. Collaboration ranked second behind analytics as a technology innovation priority. Perhaps because most of the attention on the benefits of collaboration so far has focused on front-office roles, there’s less awareness of its need in back-office and administrative functions, as I’ve pointed out before. Indeed, the same research reveals that those in front-office roles said business and social collaboration is very important to their organization five times more often than those in accounting and finance roles (21% vs. a mere 4%). However, it’s just a matter of time before the finance group understands that social collaboration has substantial potential to improve its performance. Rather than following a general broadcast model, social collaboration in ERP and other finance applications will need to understand that individuals belong to multiple groups. For example, people in a company typically have a general role (“I’m in Finance”) and one or more task-specific ones (“I’m the director of financial planning and analysis”). Some relationships are persistent while others begin and end with a project. Issues that arise may be open to all or confined to specific groups, subsets of groups or a private dialogue. Queries or comments may be general, specific or somewhere in between. Some conversations, especially in finance and tax departments, must be tightly controlled. Software that understands the context of the work performed and automates the process of managing the who, what and when of the communications will support more effective collaboration, faster completion of tasks, greater situational awareness within the organization and as a result better decision-making. Last, mobile enablement is already an important capability of some ERP systems. However, it’s important that ERP vendors focus on those elements where mobility is important and optimize the user experience for the task and platform. Unlike CRM and sales force automation systems where sales and service must be accessible anytime and anywhere, mobility’s importance in ERP depends on who uses it and why. Certain tasks such as data entry are not well suited to mobile devices, while routine reviews and approvals are. These must be simple to configure and deploy as well as use. The worst aspect of today’s ERP systems is that they inhibit change in corporations, especially in holding back finance organizations from playing a more effective role in the company. The lack of adaptability in these systems inhibits companies from making necessary changes in processes, stifling innovation. Poor user interface design as well as limited support for social interaction is an ongoing drag on productivity. Antiquated design hampers data availability. Today’s corporations are willing to put up with these issues because everyone is in the same boat. In the decade or so after the great Y2K ERP sales bubble, there hasn’t been much fundamentally new in ERP systems. This period of limited innovation fostered a substantial consolidation of existing vendors. It has justified the consolidation because companies have continued to pay rich annual maintenance fees. However, the surviving on-premises ERP vendors are now confronted by a substantial number of cloud-based challenges. They also understand that they (and their competitors) are now in a position to use technology to create truly differentiated offerings. As such, I expect to see a new wave of product innovation in the coming years that will transform ERP into more flexible and usable software.